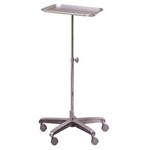 Instrument Tray - Adjustable Stainless Steel, 19.25" x 12.62" x 0.75 "
Mobile stainless steel instrument tray. Removable tray measures 12.62" x 19.25" x 0.75" with an adjustable stand ranging from 29.25" x 48.75" heights. Five leg base with five dual wheel nylon coasters. Manufactured by McKesson. Comes as singles. **THIS ITEM IS CURRENTLY ON BACKORDER. 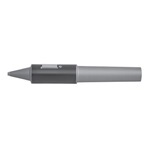 ** The Optho-Burr is a lightweight, hand-held burr powered by a replaceable AA alkaline battery. 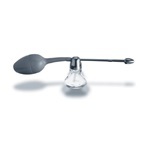 Its intended use is for the removal of foreign bodys and corneal rust rings. Handle only. Manufactured by Beaver-Visitec. Comes as singles. 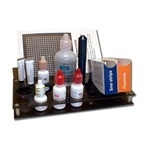 Black pharmaceutical organizer has a place for dilation drops, Shrimer and Fluorescein Strips, Dacriose or CL solutions, ointments, gonioprism, Alger Brush, and Rx pad, and Amsler Grid Pad. Can sit on desk or has holes for wall mount. Holds 11 eye drops. Comes as singles. 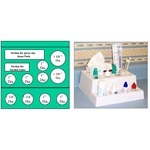 Small white plastic pharmaceutical organizer tray that provides a place for tissues, cotton swabs, 8 eye drop bottles, and wipes. 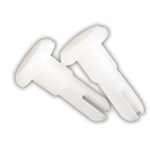 Made from ABS plastic. Measures 8"x 8.5" in size. Comes as singles. **THIS ITEM IS CURRENTLY ON BACKORDER. 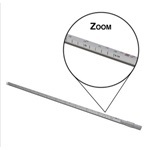 ** This phoropter replacement rod is a similar design and size as the AO. One side shows inches and diopter demand,the other side shows centimeters. Manufactured by Bernell. Comes as singles.